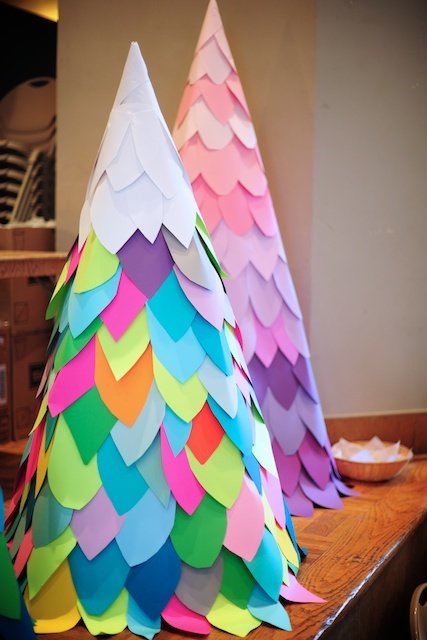 As part of our decorations for Winter Wonders, we created these so so fun, large paper Christmas trees! Several people were curious about them, so I am posting our method of making them here…just in case anyone wants to give it a try. The base for the trees was made of large pieces of cardboard. 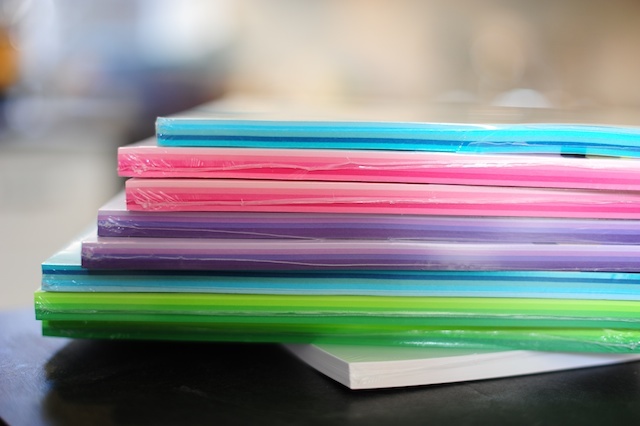 You’ll need big, thick pieces of cardboard, like these ones from a crib box. I cut the cardboard into tall triangles – I did not measure each one, but as long as they are thin on top and big on the bottom, you’ll end up with a cone shape when you place them together. We found that Tuck Tape works best for holding the cardboard. 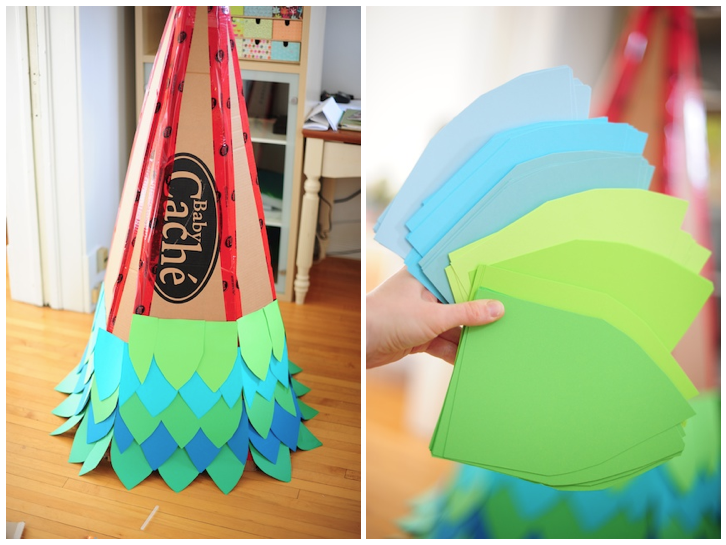 The leaves were cut from cardstock – we bought a load of those color ombre packages from Micheals planning for a few different color ways (the colorful ones were made up of our extra pieces at the end, but we all ended up liking them the best!). For a tree this size we used a standard 8.5″ x 11″ piece cut in half, and then each piece shaped into a point. 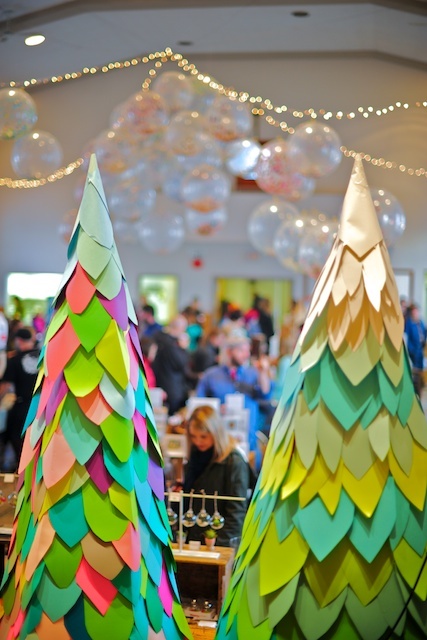 Each tree took about a package, or 50 sheets, of the cardstock. There are no pictures of us actually putting the leaves on (lots of helpers + small studio + loads of glue gun fumes…), but you start from the bottom, working your way around attaching the top (flat part) of the leaves with hot glue. Just be sure that each layer is low enough to cover the next and not leave any cardboard showing. With enough glue (*you can do anything*), you can fold the leaves around the corners, making fewer seams. The last tippity top part is a cone from a single piece of cardstock. Is your dog ever so freakin cute that it makes your teeth hurt?? 🙈 Also, my hair is so freakin cute because @klaymurry did it and doesn’t guilt me about the infrequency of my haircuts! 🙈 What a great Friday!